The Ivy League Middle School English Language Arts (ELA) program is interdisciplinary by design. Wherever possible, connections are made between historic events as recounted in texts, or personal narratives and the literature of the time. Along with high quality contemporary text, students are expected to read, comprehend and respond in writing to complex informational texts, timeless classics, Greek and Roman myths, Shakespearean dramas, short stories and poetry. Students are scheduled for seven periods of English Language Arts each week. Small class size gives the teacher the ability to vary lessons beyond lecture. This includes arranging tutorials as needed, organizing small or whole group impromptu discussions (all voices are heard) or focusing on oral delivery of information as students justify arguments, hear evidence, debate and evaluate ideas of others and offer and receive constructive criticism in a supportive environment. To keep content current and relevant, teachers utilize a variety of digital techniques including teacher moderated blogs, in-school workshops by visiting groups such as the Shakespeare Forum, and class trips to the theater or movies where all students learn to appreciate and a gain better understanding of other forms of expression surrounding them. In the formal teaching of reading and writing, the teacher often utilizes mentor texts and exemplary passages of writing in a genre which may be read and reread for many different purposes. Deep reading and analysis help students understand nuances of structure, word choice and grammatical conventions as they apply to different text types, opinion pieces, short stories, poetry, drama, personal narratives or essays. As students become familiar with the writing of masters, they begin to imitate style and structure. Eventually, they find their own voices and use their unique gifts to create original pieces which emerge as a form of authentic writing with its own purpose. 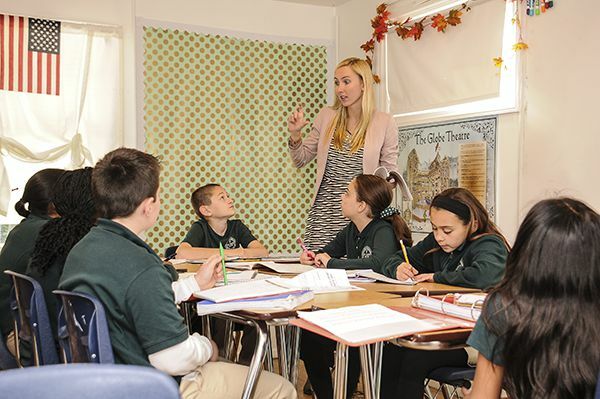 Throughout Ivy League’s Middle School, students receive frequent formal lessons in the structure and usage of English with an emphasis on grammar, application of punctuation, and a more sophisticated vocabulary of discourse. The Middle School English Language Arts also exposes young minds to an array of increasingly difficult texts and tasks. Students read novels such as Esperanza Rising and Crispin: The Cross of Lead, timeless classics such as William Shakespeare’s Romeo and Juliet, Fahrenheit 451, an early dystopian novel, or they annotate modern American classics such as To Kill a Mockingbird. They relate a central idea of a book to current issues in our society, respond thoughtfully to probing questions, express opinions or make text to text comparisons. In a final assignment, students may be required to complete a themed research paper which takes their knowledge of ELA full circle as they apply their research skills and demonstrates their ability to write for informational purposes. Through close cooperation with teachers of Social Studies and Science, students learn to research beyond Google, take and organize notes, weave textual evidence into their writing, utilize educational databases and journals, build bibliographies and cite sources. By the end of eighth grade, Ivy League students can write a tentative thesis statement, refine it, go on to seek evidence to support or defend their statement in oral argument. In an information and media saturated society, we strongly believe that providing students with the skills to read and write proficiently, speak clearly and effectively and think critically, is the optimum way to prepare students for high school and to ultimately take their place as literate citizens of the world.